I moved all the books in Andrew's room in order to redo the floors. 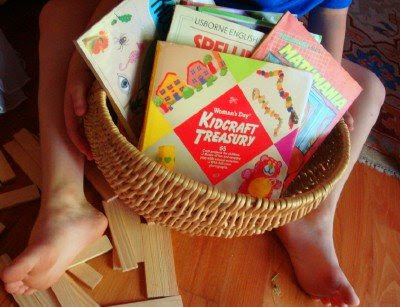 Whenever I discovered an art, craft, or work book, I threw it into an "I'm Bored" basket for summer. I just wanted you to know how much I have been enjoying your "use what I have" theme. It helped me change my focus from the "to do" list and a very utilitarian mindset to specifically looking for things that I haven't used for a long time or haven't used at all yet. "Using what I have" feels more like a scavenger hunt. I have started wearing my contacts more, got out a demitasse set that we received as a wedding present to use for tea--it functions just lovely as a teapot with "child sized" tea cups (and my husband used it for its correct purpose, coffee, on Sunday morning). My Oreck Orbiter has seen the light of day and my kids used an accessory to it that we had never used. The Briwax was used, books read, games played. You get the idea--and that's not counting the fabric and yarn. Oh how fun and great idea! I love the bored basket idea. I need to put one together for Levi - Brenna and Jack seem to have no trouble entertaining themselves! I've been working on putting together a box of goodies for when the baby's born - activity books will be perfect! And we have tons of them in every nook and corner. How very sweet! It's always nice to receive encouragement and know that our words or actions are making a difference. My mother used to do the same thing when I was a little girl. That was many years ago, we were a large family, and there weren't so many toys. She would occasionally put away partly colored books, story books, etc. When she brought them out again, we were as thrilled as if she had just bought us several things at once! Speaking of the floors in Andrew's room, what did you decide to do? I hope we see "after" pictures soon! Children just seem to love anything that ISN'T in its proper place, and to ignore things that are. Just try to throw something away that has been hanging around for years. When it's in the trash, they want it!! The best part about your ideas is that they make me feel like it's something cool rather than having to settle for less than I'd like because money is tight. "I will solemnly swear to stay out of TJ MAXX and use what I have and not buy stuff b/c it's on clearance on the last row in the home section, although it's a great deal and fits the budget - I will go to my closets and line everything out and organize myself over the next few months - I have been bad"
whew - that hurt. Thank you, meredith. Any reason that you know of that I have been redirected to Like Merchant Ship.org? Just wondering. likemerchantships.org is the new domain name I bought through Blogger. Yesterday Blogger was undergoing some major maintenance and there has been a problem with redirecting links for a while. And you should be able to continue to use old links using the http://likemerchantships.blogspot.com address once the maintenance is complete.